Let us now meditate first on some writing and then on some design, if they are different, which I'm not certain they are. In the most recent issue of the literary journal, Ninth Letter, an essay appears which pushes our understanding of what an essay is and what it might contain or do or be. 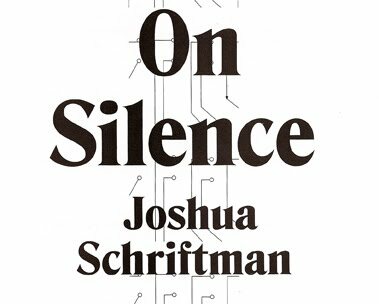 Enveloped in a search for quiet, On Silence, by Joshua Schriftman, considers an expanse of information from muses to language; from the decibel to death. The piece is a centrifuge at whose center is Andrea, or love perhaps. (What? I'm a closeted romantic. Step off.) Essentially, the piece is simultaneously soundless and loud in its earnest attempt at internal quiet. If not loud, exactly, then intense. But let's talk about form. 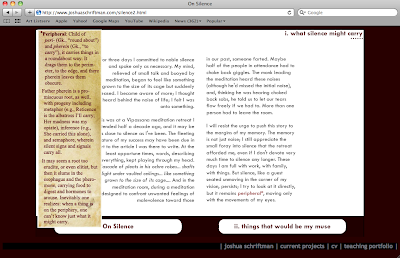 The non-linear narrative offers silence as an elusive character whom our author seeks. In his search, we see two forms of footnotes, a chart, some diagrams and a numeric organizing principle. This fragmented narrative ultimately comprises a layered whole, where we are first compelled by the meditation on silence and later drawn into the story of a relationship and its subsequent failures. 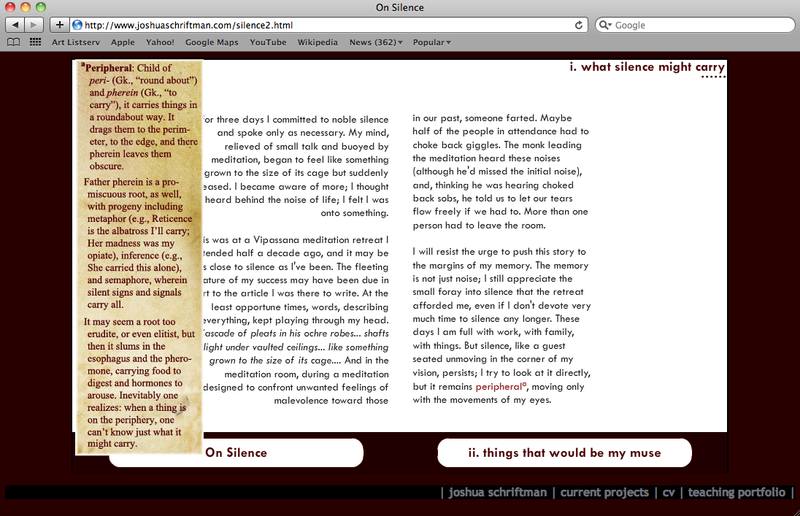 After reading the story, engaging with the forms, I began a post-essay stalk and was happy to find Schriftman on the internets and then-gasp!-a website for On Silence, with sound even. The site is password-protected, so I emailed Schriftman. He generously offered to share the site with me, which basically allows the user to navigate through the essay while experiencing sound, clicking and reading. In other words: it's a manifestation of the form of the essay itself, with moving footnotes and multisensory experiences. Can you discuss your process? My process was about one percent writing and ninety-nine percent revision...I tried to make each [chapter] a sort of complete essay unto itself, and the constant question on my mind was how to maintain a certain tension throughout. Did you draw the illustrations for this piece? I didn't draw the illustrations, although I sort of love them. [Ninth Letter] took a rather abstract approach that I think I might have been afraid of attempting [in his website, which has visuals] and doing so with a kind of ironic play on structure and flow. I personally believe their schematics work very with with the text of my essay. Would you call this an essay? Yes. [Insert humble commentary and reference to D'Agata.] I think an essay is essentially an experiment, a no-holds-barred attempt to get at something. What are you reading? Who's influenced you? Any literary journals you're digging? What does this mean for the essay as form? The interrogation of moments (or pieces) as a means of comprising something cohesive reflects, I think, the way our minds work. Linear writing has always struck me as more false than other kinds of nonfiction, especially now in the way that information is increasingly accessible to us. Put another way, the combination of forms accurately reflects the human experience, and maybe even offers the most logical container for each piece of the whole. Of course, I have no idea what this might do for the essay; but I do think Schriftman's piece is part of a larger moment in which we investigate the essay. Last year, Ninth Letter was presented to me as the literary journal towards which all other journals should strive. More specifically, this was what all journals should look like. And the journal certainly is beautiful and beautifully considered, from ephemera planted in its interior pages to its poster-folded-as-dust jacket exterior. The journal has become an object to be considered, or perhaps a series of objects to comprise a whole. The journal is the product of a collaboration between the Graduate Creative Writing program and the School of Art + Design at the University of Illinois. Part of the journal's mission is to curate exceptional writing as illuminated by "cutting-edge" graphic design. It should be noted that the journal has been featured in impressive design powerhouses like HOW Magazine and Print Magazine. When the recent issue arrived in my mailbox, I guess I was expecting more pictures. The journal wants to be experimental and, comparatively, I believe it is in the way that content is considered on the same playing field as form. Undergrads spend an entire semester developing the look of the journal. In this issue, the intention of the designers was to make images that reflect the reading, thereby adding another layer of concept to the work. 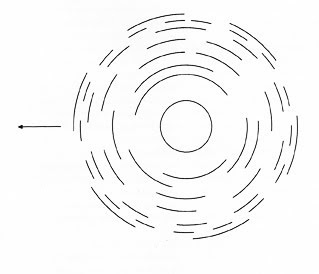 For instance, in Schriftman's essay, we see sort of abstract diagrams which reference, I think, sound or maybe silence, or even both. But to me, they still feel outside of the essay. They are necessarily separate from the text and this kind of juxtaposition feels slightly forced. I feel sort of alone in this desire, for words to be smashed with images. But I wonder if this is where the essay might go. Certainly, Ninth Letter moves us in this direction. I just hope for more: more images, more graphic-y writing, more objects falling out of the pages and into our hands. More. "Put another way, the combination of forms accurately reflects the human experience, and maybe even offers the most logical container for each piece of the whole." Lovely. I do not agree with you in that linear non-fiction is more false than others, but I do agree that the combination of forms more accurately represents our experience. I think the goal is different, though. Linear writing strikes me as an author seeking an answer to a snapshotted whole; combinations take the whole of our experience and chronicles them until the reader may withdraw a solution. Schriftman seems to be doing the later with this piece. And although I did not feel that all of his connections were clearly associated, I do feel that in their inexplicable connections he did regale us with a logical whole. It's now just a matter of whether each reader would agree upon what that logical whole is. Is writing really communication if every reader/writer can take something completely different from the same text? Interesting, yes. I think it's worth thinking about the difference between design done post-writing and design as a part of the writing process. When I say "writing" I really mean "creation" since it seems to me that this applies to most arts. That is, if the visual is part of the artist's creative process, or if it's dressed up by someone else. I know that Ninth Letter does publish some already-designed material. But in a lot of ways it works kind of like one of my favorites, Born Magazine , which (primarily) accepts writing and then gives it to a designer who does the multimedia freakout on it. Unlike, say, an old school (and I believe defunct) magazine like Chain, which had a lot of visual experiments, but I remember them being mostly executed entirely by the writer/artist, not by a two-person collaboration. Probably for pure designers who take on projects for Ninth Letter or Born, the success of the project has more to do with the skill of the designer as a designer and also as a reader, and probably in whatever interpretive space exists between writer, text, and reader. It would be interesting to know more about how collaborative Ninth Letter's process is. That more often than not this is the model also speaks--perhaps--to the relative rarity of those beasts who do both writing and design well, and use both consistently in their creative process. @Shelley: Communication's full name should be "attempt at communication." 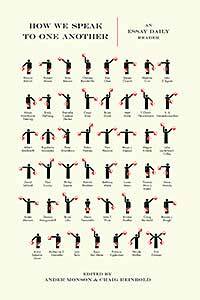 All writing (or communication of any kind--body language, visual art, whatever) is a collaboration between the creator of the sign and the interpreter of the sign. Letters are symbols signifying sounds; sounds combined in a certain way signify ideas. That's the beauty part. Not only can writing be interpreted differently by everyone that encounters it, but it will be. It is. Interpretation, filtered through the particulars of the mind doing the interpreting, is inherent in the reading. So I see visual art (especially abstract) and graphic design as equal to written language in their availability for multiple interpretations, and that begs the question of why the two don't meet more often, as Ander and Margie ask.